CHASING FOOD DREAMS: Celebrate Chinese New Year with GAB’s Three Iconic Brews to Usher in a Year Overflowing with Fu, Lu and Shou! Celebrate Chinese New Year with GAB’s Three Iconic Brews to Usher in a Year Overflowing with Fu, Lu and Shou! Let’s raise our glass and cheer Yum Seng with family and friends as GAB (Guinness Anchor Berhad) launches their ‘Celebration of Good Fortune, Prosperity and Longevity’ campaign which promises great promotions, exciting activities and auspicious events for loyal consumers to usher in the Year of the Snake. Spearheaded by Guinness Anchor Berhad’s own iconic trio of brews, Guinness, Tiger and Anchor, this nationwide promotion will reward discerning drinkers with an abundance of fortune, prosperity and longevity throughout the year and beyond. We assembled at GAB Tavern for a few hours of the launch of this Chinese New Year’s promotion to catch a glimpse of the famous Fu Lu Shou figurines made from solid gold and the three stars of GAB, Tiger, Guinness and Anchor. The event was graced by the GAB team, three auspicious lions, GAB ambassadors and entertainment artists. 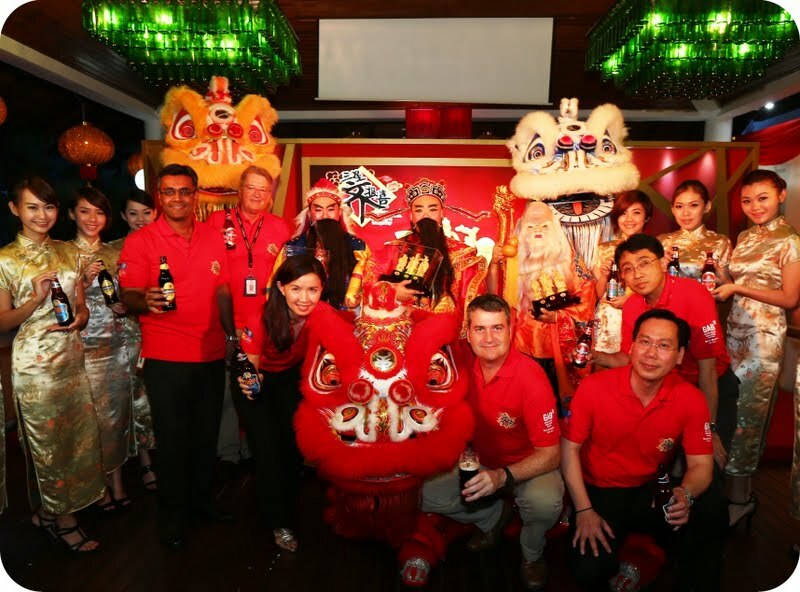 Guinness Anchor Berhad’s Managing Director, Charles Ireland (查尔斯爱尔兰 – fourth from left), Marketing Director, Yap Swee Leng (叶瑞玲 - third from left) and Sales Director, Thum Chee Yuen (谭智远 – fifth from left) along with other members of the Guinness Anchor Berhad Management Team strike a pose with the three Fu Lu Shou deities during the campaign launch. For generations, the Fu Lu Shou has been central to the Chinese community, bestowing good fortune, wealth and health whenever they are sighted together. 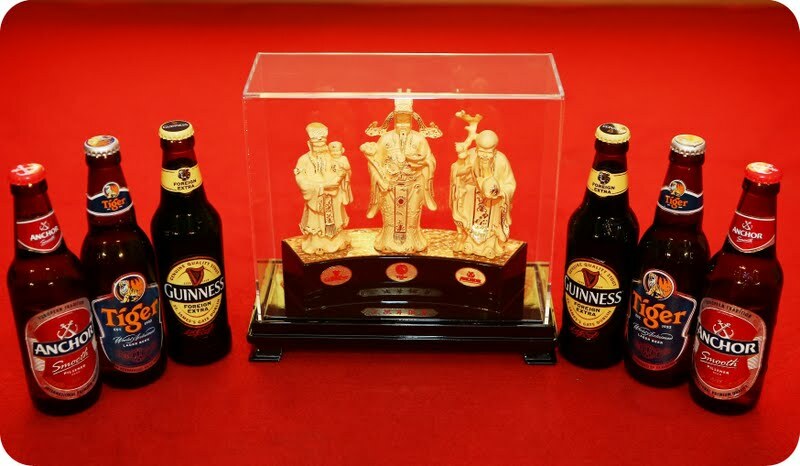 With its loyal drinkers in mind, GAB has put together a Chinese New Year offering that will reward them with the three Chinese star deities of Fu (福), Lu (禄) and Shou (寿) whenever they pick GAB’s own three stars; Guinness, Tiger and Anchor. 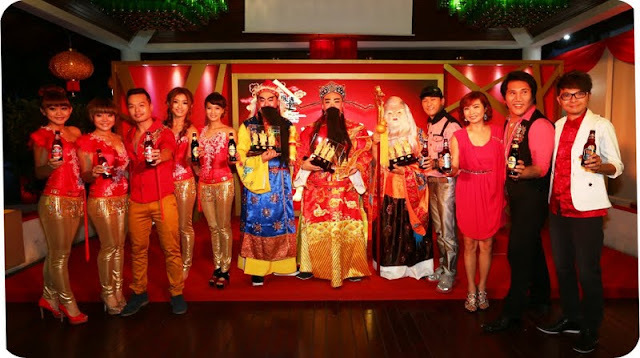 This festive season, enjoy big bottles of GAB’s three iconic brews, Guinness, Tiger or Anchor to stand a chance to win one of nine solid gold Fu Lu Shou sets worth RM 10,000 each or 999 gold-plated Fu Lu Shou sets worth RM 1,000 each. You can also redeem 18 bottle liners for a Fu Lu Shou set to ensure good favour, wealth and health in the New Year ahead. In addition to an auspicious nationwide consumer promotion, this Lunar New Year will see GAB host a series of seven charity dinners to raise funds for worthy causes featuring appearances from talented local Chinese artistes. This year, GAB will also be organizing a series of charity dinners to raise funds for worthy causes such as for the refurbishment of the Chan She Shu Yuen Clan Association (陈氏书院) Hall as well as six other Chinese communities and villages across the country. These fundraising events will feature a Chinese dinner with Yee Sang and GAB’s iconic beers, great live entertainment and an all-round memorable time for all attendees, as well as a charity bazaar that also contributes funds towards the worthy cause of the dinners. Hanging out at The Tavern for a couple pints! Let’s Join in the Fun… who knows… you may win yourself the auspicious solid gold set of Fu Lu Shou!! This Chinese New Year, be sure to think of GAB’s three iconic stars and you will receive an overflow of Good Fortune, Prosperity and Longevity. For more information on this campaign, please visit www.gab.com.my today. Ooooo...solid gold!!!! I want!!! But I don't drink, how?